Faced with a governor trying to stop them from playing Loyola, the Mississippi State basketball team did the honorable thing—they snuck out of the state. When the two teams faced off, security was tight. The game went off without a hitch. Loyola came from behind to win, 61-51. Loyola’s next game was more relaxed, with no off-court drama. They blew past Illinois, 79-64. Next the Ramblers moved to Louisville for the Final Four. Their opening opponent was Duke, another all-white team from the South, ranked #2 in the nation. Again Loyola won easily, 94-75. Now it was Saturday, March 23, 1963. Loyola was set to meet the Cincinnati Bearcats for the NCAA championship. It was a dream match-up—college basketball’s top offense versus college basketball’s toughest defense. And few people gave Loyola a chance. Cincinnati had won the last two NCAA tournaments. They were trying to become the first college in history to post a three-peat. The current team had an aura of invincibility. Some bookies were listing the Bearcats as 25-to-1 favorites. Loyola looked nervous in the first half, missing 13 of their first 14 shots. Harkness was totally shut out. Luckily for the Ramblers, Cincinnati was having problems, too. The half ended with Cincinnati on top, but only by 29-21. Cincinnati came out hard in the second half, widening their lead to 45-30. However, three players were in foul trouble. With nearly 15 minutes left, the Cincinnati coach decided to play safe and put on a stall. In 1963 there was no shot-clock. Loyola began to chip away at the lead. Harkness finally came to life, scored a basket, then stole the ball and followed up with another one. Before Cincinnati realized what was happening, Loyola had closed to within 3 points. By now most of the 20,000 fans in the stands were cheering for underdog Loyola. With 12 seconds left, Loyola still trailed 54-52. Then Hunter grabbed a rebound, passed it to Miller, who passed it to Harkness—who put in a 12-footer. Regulation time ended with the score tied. Overtime! The teams traded points back and forth. As the clock wound down with the score 58-58, now it was Loyola’s turn to stall, playing for the last shot. In the final seconds, Hunter shot and missed. But Rouse got the ball and made the basket, just beating the buzzer. Loyola-60, Cincinnati-58. 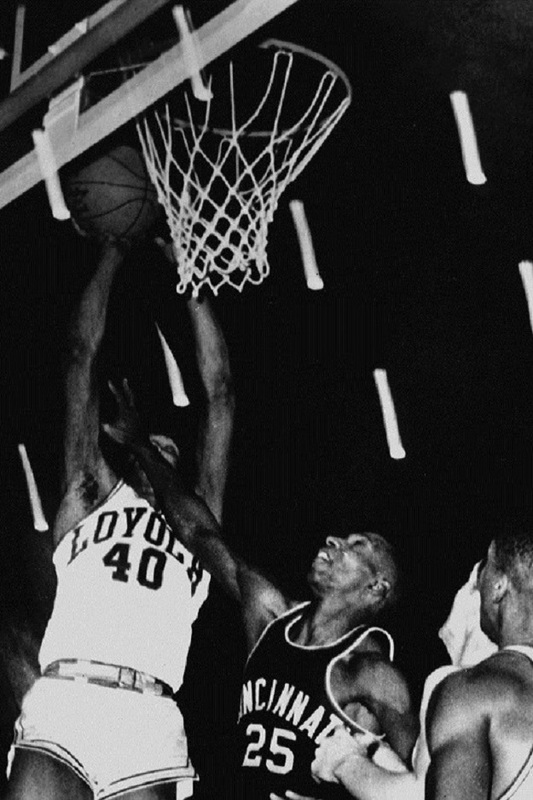 "The greatest comeback in basketball history," one writer called it. 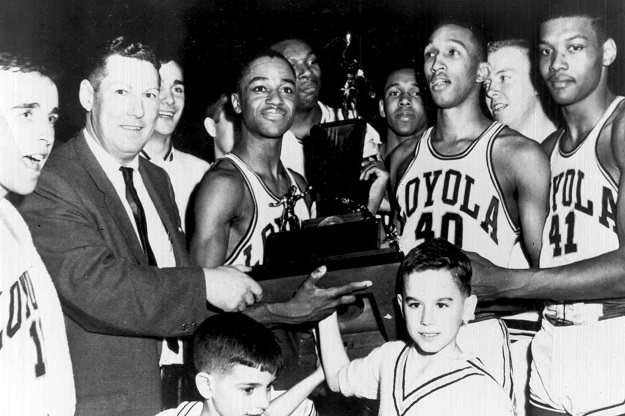 Loyola had become the first Illinois school to win an NCAA Division I basketball championship. A half-century later, it’s still the only one. There is a local post-script. The Loyola-Cincinnati game had gone out live over the radio. But the TV broadcast back to Chicago was on tape-delay. So throughout the city, many crafty radio listeners used their knowledge of Loyola’s amazing comeback to clean up on bar-room bets. This last story may be only an urban legend. But I wouldn’t bet on it.